Try this easy, warming soup with a hint of spice that's packed full of flavour and goodness! It's 2 of your 5 a day so makes a great healthy lunch. Preheat the oven to 180°C / 350°F / gas 4. Cut the butternut squash into quarters, place on a baking tray and drizzle 2 tsp of olive oil over them. Sprinkle the cumin seeds over each quarter. Place in the oven for 45 minutes or until soft. Cut the celery, carrot and onion then put into the saucepan with 1 tsp of olive oil, season with pepper and cook on a medium heat until soft. When the butternut squash is ready scoop it out and place it in the saucepan along with the other vegetables. Prepare you vegetable stock and pour in a little at a time. Using a blender give your mixture a good blitz until all your stock has gone. Add the salt, ground cumin and cayenne chilli pepper then give it another mix. Keep mixing until the consitstansey is nice and smooth. If you like your soup a bit thinner just add a bit of water and mix again. Put your soup back on the hob and simmer until warm. Cut the crust off your bread and cut up into squares. Add 1tsp of oil to the frying pan and add your cubes facing down then leave on a medium heat for 2 minutes. Turn the croutons and do the same for the other side. Add your rosemary to infuse in to the croutons. Put the pan into the oven for 4-5 minutes, be sure to keep an eye on them, you don't want them to burn. 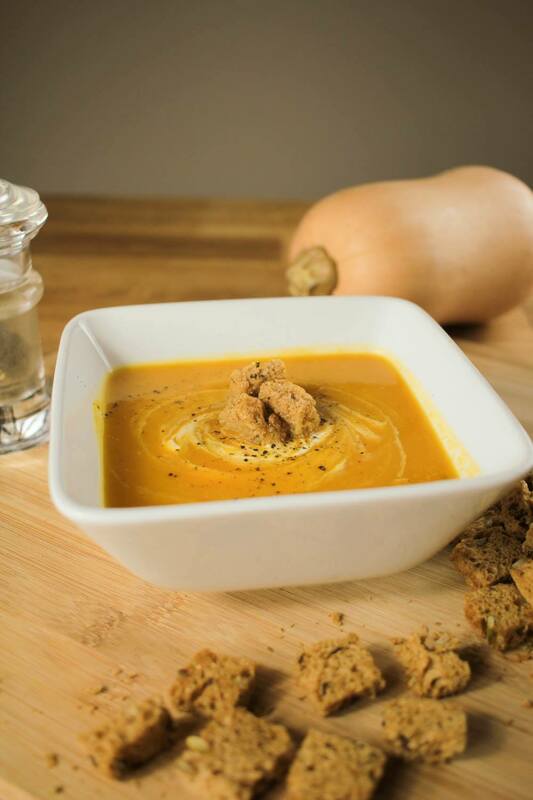 Serve you soup in a bowl and add a spoonful of creme fresh, this will help cool the spice down. Sprinkle with croutons and enjoy!